#6-32 x 1-3/4-inch (45mm) Phillips-head screw for playfield posts. Often stripped, broken, or bent on most games. Grab a few for valuable spares! Replaces Bally / Williams # 4006-01005-26. 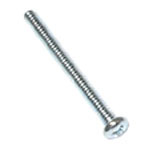 Use #6-32 tee nut for under-playfield mounting of this screw.